Pleasant enough pub with decent service. The GK IPA was in fine form, but £4.30 a pint is a bit eye-watering given that it is so much cheaper elsewhere. On my visit - a Tuesday evening in January - it was rather noisy. Some City types who bought a round and then spent the next hour shouting and boasting to each other being the source. Yawn. 7/10. Not very busy late last night is about as much as I remember. Think I had a Batemans XB which I suppose would have been a guest ale. 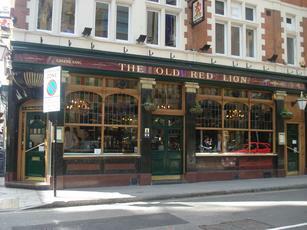 I worked for a time in The Red Lion in Holborn, it was a fabulous little pub very busy with a lovely clientelle, small pub but oozed class and no little charm, I really enjoyed working there. Average kind of pub. Ale was okay as opposed to good and also your average central London £4 odd a pint. Would drop by if in the iciity for a pint but that's about it. Visited on 21 Jan. Greene King pub serving IPA, Abbot and Hen but also guests which were York Terrier and Springhead Robin Hood. Small pub packed on a Friday night. Not bad for a GK pub.